This sculpture by Xiaohai Zhou MDes 19 is among the illuminating work students created in an inspiring interdisciplinary Wintersession studio. Like so many of the individual pieces of any given city, the sheets of architectural glass that divide concrete and commerce are easily taken for granted. 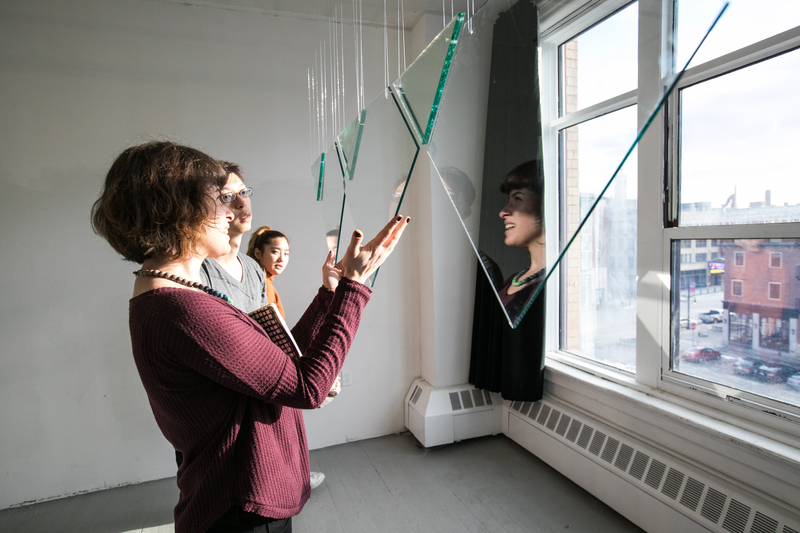 But for grad students Ipek Kosova MFA 18 GL and Corwyn Lund MFA 18 SC, the way these transparent panes shape our everyday lives has their complete critical attention. How have glass storefronts changed the way people think about privacy? How do mirrored skyscrapers shape our sense of being in urban landscapes? It’s questions like these that drive their respective practices and informed Luminous Structures, an interdisciplinary Glass/Sculpture studio they conceived of and led during Wintersession. 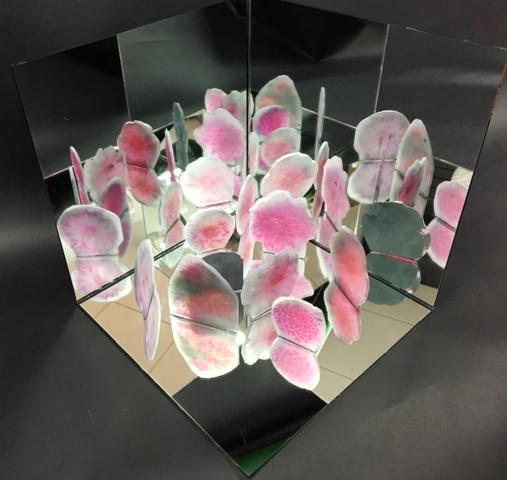 In addressing these questions and more, students in the class transformed a variety of transparent and reflective materials into highly conceptual, visually arresting sculptures. Ipek Kosova MFA 18 GL (foreground and below) admires work at the final crit for Luminous Structures, which she co-taught with Corwyn Lund MFA 18 SC. 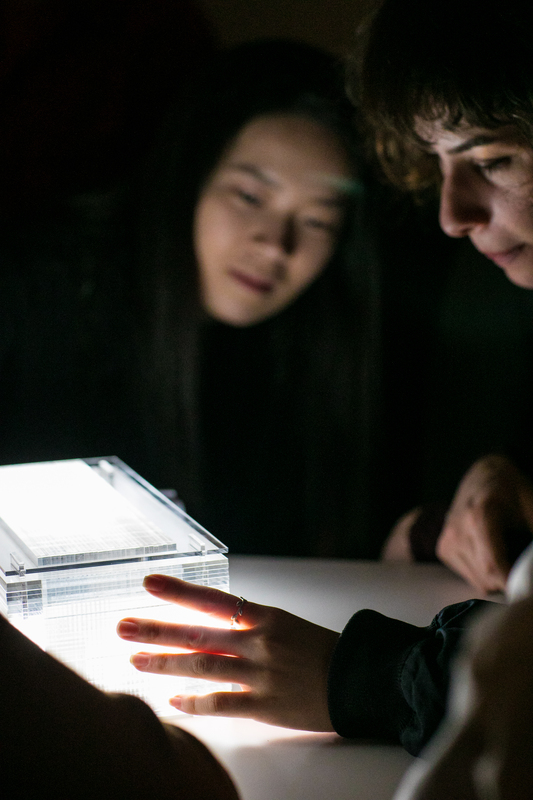 Having similar multidisciplinary backgrounds, the instructors designed Luminous Structures so that students could investigate how architectural and fine-art approaches to glass intersect with their specific disciplines. Lund says that he wanted to create the kind of course he’s always gravitated toward as a student—“one that proposes something really radical” and transforms how makers work in the studio. So he and Kosova, who previously explored the history of glass architecture as a grad student in her native Istanbul, threaded the historical and theoretical underpinnings of their own creative practices into projects that encouraged students to experiment with materials and play with big ideas. Students also took advantage of the advanced equipment at Co-Works, RISD’s interdisciplinary fabrication studio, in order to execute their work. Since nearly all of the students in Luminous Structures are majoring in architecture and design disciplines, Kosova and Lund leveraged their experience in fine art as a foil to participants’ established studio practices. (If the reverse had been true, the instructors acknowledge, they would have likely emphasized their expertise in architecture to provide a similar counterpoint.) Students also discovered how artists like Sarah Oppenheimer, James Turrell and RISD alum James Carpenter 72 IL have pushed the possibilities of making with architectural glass. For Dahlia Garden after Robert Smithson, Peter Heller MArch 20 UV-printed images of flowers onto organic, sandblasted glass in homage to the influential land artist. “I really appreciate [how the studio] balanced critical thinking, research and freedom of practice,” says Jae Won Kim 20 GD, who was excited to revisit her interest in sculpture and consider the role of materiality in graphic design. For one project, Kim transformed everyday objects—wall outlets, clothes hangers, shower drains—into mirrors, wanting “to see how the meaning of these objects changes" when users are confronted with their own reflection. In critiquing the project, the instructors noted similarities between Kim’s photo documentation of her work and the voyeuristic cinema of Alfred Hitchcock. Lund (center) hopes that Luminous Structures provides a “toolkit of knowledge and resources” for students—now and in the future. Peter Heller MArch 20 says that Luminous Structures has radically transformed how he thinks about architectural practice. 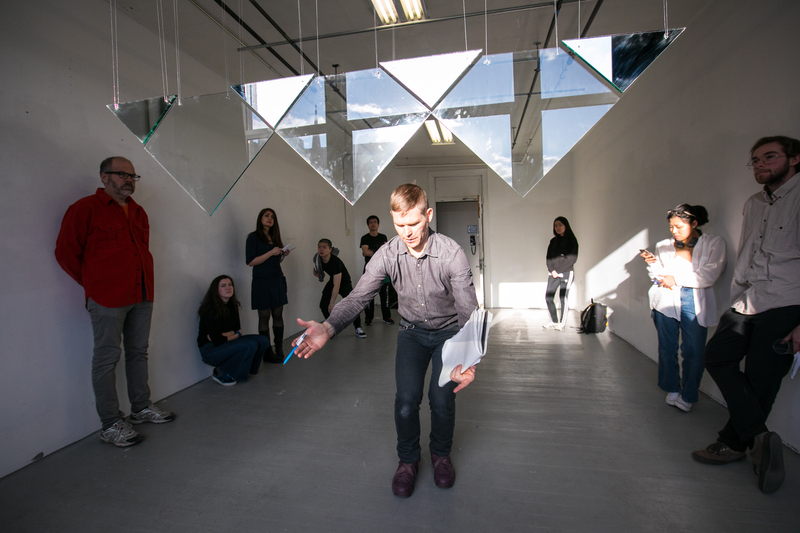 In a final project titled Transparency to Reflection (his first-ever public installation), he hung glass-and-mirror columns at eye level and watched how viewers circulated through a space transformed by reflected light and images. “At the conceptual level,” Heller says, “I've developed a new awareness of how others will interact with my work.” He also appreciates getting a grounding in the history of architectural glass, along with inspiration from the work of Robert Smithson and other noted artists. Students in a thought-provoking Wintersession course question societal norms that shape our everyday lives. A look at how the department teaches students to take risks, cross disciplinary divides and write their own stories as professional artists.